Clarence Frederick Cork was born in Wolstanton on 3rd March 1898 to Charles Richard and Emma Cork. Charles was born in Hinstock Shropshire and Emma in Knightley in Staffordshire. He had two older brothers and sister and the family lived at 40 Heaton Terrace, Porthill. Clarence was christened in Wolstanton, presumably at St. Margaret’s Church, on 30th March 1898. Clarence’s cousins (on their father’s side), Thomas and Percy, were also Porthill Scouts. Thomas was, sadly, killed in the Great War, but Percy survived. Not a lot more about his life before he joined the army is known, other than he worked for his father as a plumber. He joined the army on 12th April 1915 aged 17 although his record says 16 and in another place it could be 19! His record states that he was 5 feet 5 inches (or 3 7/8) tall and had a chest size of 34 inches. He wore glasses. 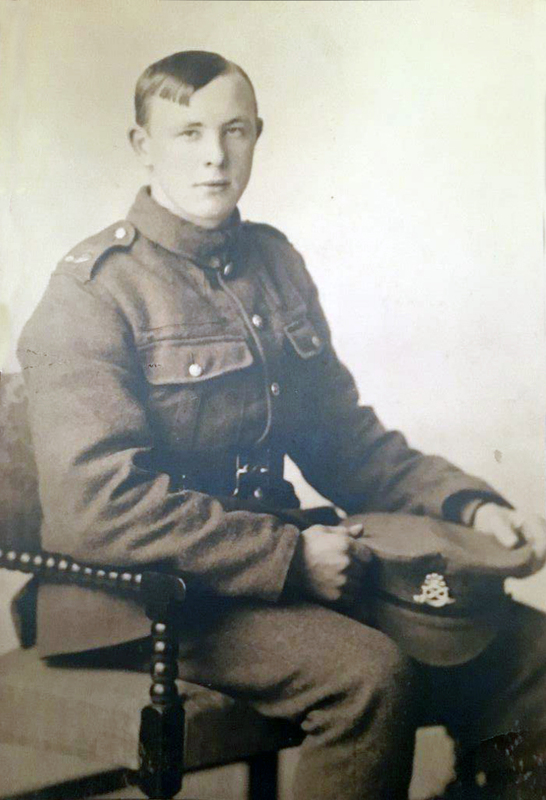 When he joined up, he was Private Clarence Cork, 4538 3rd, 5th, North Staffordshire Regiment. 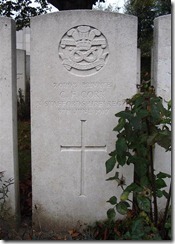 He served in the UK until he was sent to France on 25th April 1917. 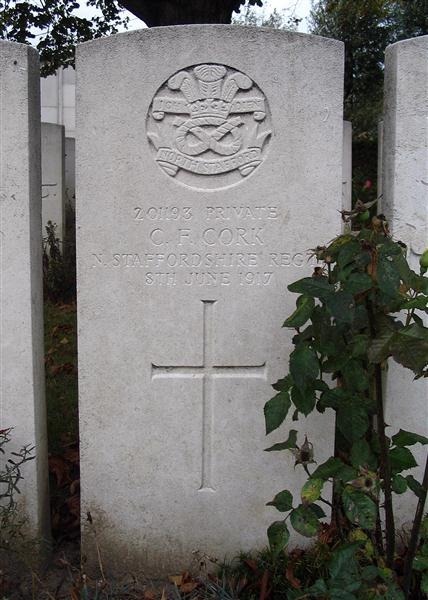 On 16th May 1917 he was transferred to 8th Battalion, North Staffordshire Regiment and was renumbered 201193. 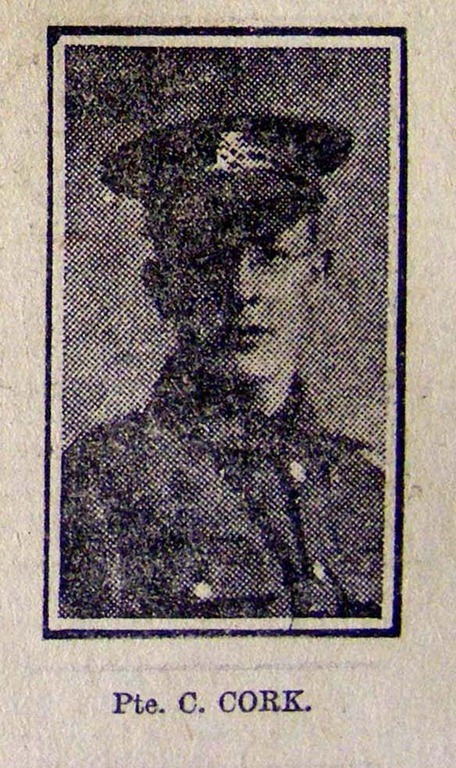 He died of wounds received in action on 8th June 1917 aged 19. He spent 45 days in the British Expeditionary Force in France and Belgium. When men were wounded or killed in WW1, the local newspaper, the Staffordshire Weekly Sentinel, would publish their details. Official news have been received by Mr. And Mrs. Clarence Cork, 40, Heaton Terrace, Porthill, of the death from wounds of their son, Signaller Clarence Cork, of the North Staffs. Regt. He was 19 years of age, and prior to his enlistment in March 1915, he was employed by his father as a plumber and painter. The announcement would often include a photograph or the soldier. Clarence Frederick Cork was awarded the British War Medal and the Allied Victory Medal. He is commemorated and buried at Dickebusch New Military Cemetery Extension, Belgium and on our Memorial. In October 2017, we we contacted by Clarence’s great nephew, Simon. I am the great nephew of Clarence Cork. After looking at your website i noticed a Tom and Percy Cork. These are relatives I did not know about. I was brought up at 44 Heaton Terrace which in WW1 was number 40. On the census document it nice to see my Grandad Archie (Clarence’s older brother). There is a sad story of Archie forcing him on the train at Longport station and never seeing him again. One of Clarence’s other great nephews is the former England cricketer Dominic Cork.